Many antique shop signs were shaped or painted to give an idea of the type of business. I thought it would be fun to make a book store sign shaped like a whale. You just need a plank, pencil, sandpaper, paint, hanging hardware and a jigsaw for this project. Sketch your outline on the plank, cut with jigsaw, sand edges, and paint. 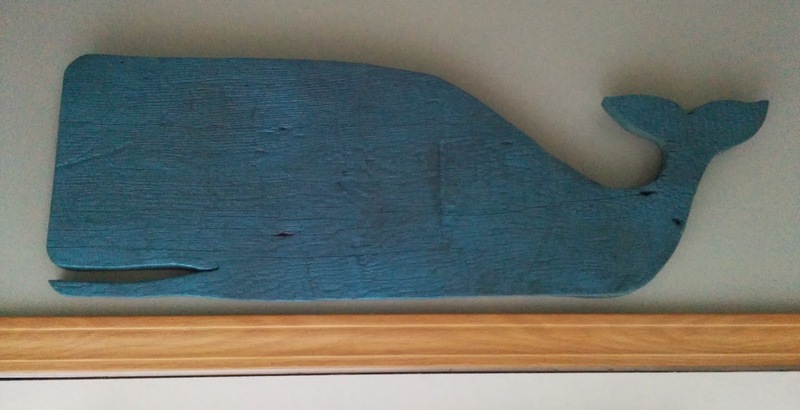 I used a few light layers of dusty teal and dark gray to get a weathered look for my whale cut out. I had a very sad moment when my whale's tail broke off! I was able to perform surgery with wood glue, a screw, and my power drill. The plank I used is a thick piece of hardwood my dad salvaged from an old building he tore down. It's probably about 100 years old, so it's not surprising it had trouble holding up to the stress of the jigsaw. I love the character of the old wood; the cracks, gouges, and nails give it life. If you have a piece of old wood, you can use the imperfections as part of your design. The eye of my whale is painted where there was already a hole and nail. If your wood is new, before you paint it put some chicken wire or chain on top and hit it with a hammer to give some texture (practice on scraps first). I originally planned to paint a shop name on my whale, but wasn't very happy with my mock up. I might paint it on a separate board and then suspend my whale underneath with eyebolts and chain, but for now she's happy perching above my back door. I used some hanging hardware I had on hand to mount my whale. You can purchase kits very cheaply in the hardware department of Target or framing section of JoAnn's.